Be the first to share your favorite memory, photo or story of Pluma. This memorial page is dedicated for family, friends and future generations to celebrate the life of their loved one. July 5th 1924 the world was given a gift in the name and form of Pluma “Jackson,” McDowell. Born in Columbia Louisiana to Robert & Lucinda (Mama Cindy) Jackson of Caldwell Parish, she was the fifth child of eleven and is survived by 2 sisters, Ida Lee Paul of Denver, CO and Cornelia (Pete) Fenrick of Waxhaw, North Carolina. She leaves behind her loving children Veronica Lynn Boyd of Aurora, Colorado, Ceasar Lee McDowell, of Boston, Massachusetts and Mary Ann Threats also of Aurora. Pluma was blessed with 5 grandchildren, Aleta Boyd, Jeri Lynn Steen and Joel Boyd all of Aurora Colorado, Garbielle McDowell of Anchorage Alaska and Brandon McDowell of Boston, Massachusetts. Pluma also has 3 great grandchildren the first being Ashley Pluma McDowell of Seattle Washington, Jordyn Steen of Aurora, Colorado and Cassius Lee McDowell of Boston Massachusetts. Pluma graduated from Columbia High School in 1942 and went on to marry her husband Robert McDowell of Grayson Louisiana August 7th, 1942. Robert and Pluma moved to Denver in 1945 with their first born child, Veronica Lynn. As a graduate of the Denver Academy of Nursing in 1949 Pluma worked at Rose Memorial Hospital in the maternity ward. This must have been ab inspiration as a year later her son Ceasar Lee was born. Married for 55 years, Pluma was preceded in in death by Robert August 31, 1997. Macedonia Baptist Church has been Plumas home church since 1948 and she was a long time faithful member of Circle #3. Pluma was a vibrant resourceful woman who had a deep love for God first, family, friends and community. You could often find her in the kitchen cooking or backing for special occasion and holidays making sure there was always MORE than enough for all. Her Gumbo and sweet potato pies became her signature and were enjoyed by all who knew her. As well as her talent in the kitchen she was also known to be very good with her hands and would sew one of a kind garments, Christmas stockings and sometimes even jewelry. She was truly gifted. Suffering from a back injury which led to many surgeries over the years sometimes mad it very difficult for Pluma but you can rest assured that if there was family or a friend in need or a commitment she had agreed to, she was one to endure the pain and contribute to the cause with her entire heart and soul! One thing about Plum we all know for sure is you never had to wonder about where you stood with her. Honesty, love and her motto of, “Always do the RIGHT thing!” resounds with us today. There are so many moments, stories and things that we will miss about her. Those of us left behind who knew her and loved her can honor her memory here today and know that we are blessed to have had her in our lives. 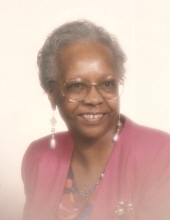 To send flowers or a remembrance gift to the family of Pluma J. McDowell, please visit our Tribute Store. "Email Address" would like to share the life celebration of Pluma J. McDowell. Click on the "link" to go to share a favorite memory or leave a condolence message for the family.